Friday’s announcement by Penguins ownership rocked the foundation of the city of Pittsburgh. 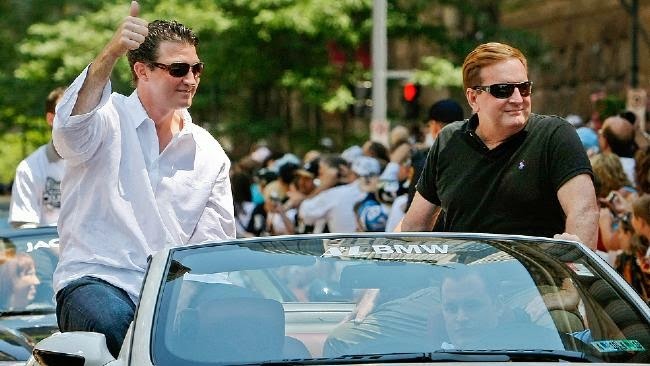 Ron Burkle and Mario Lemieux chose to stay away from the emotionally explosive press conference. Instead, they hand-picked two trusted media professionals, granting each on the record, nothing barred interviews. Dejan Kovacevic of The Pittsburgh Tribune-Review, was one of those journalists. I was privileged to be granted an interview with Kovacevic. I wasn’t permitted to ask about the interview itself but DK permitted a look inside the room at the emotion and demeanor surrounding the defining moment of the 2013 – 2014 season. Pens Initiative: When David Morehouse made the announcement, were you waiting for more? What was the press conference like? You and the rest of the media went with a certain expectation. Dejan Kovacevic: I know I was. My initial thought was that he was going to split the announcement into two, out of some respect for both. But as he kept going and never mentioned Dan Bylsma, it became clear something was off. I raised my hand for the mic and had it whispered to me that I’d be eighth from that point. I had a backup question kind of planned in my head until the main was still available when my turn came. DK: And no, I hadn’t thought of ‘element of weirdness’ in advance. Just kind of popped into my head thinking about the whole scene. PI: Fans were upset that Mario wasn’t present. Was there backlash that Mario didn't attend the presser? Do you feel today's unprecedented access was a way for L&B to make themselves available and accountable but in a controlled way? DK: There wouldn’t be backlash in a press conference room, if you mean among ourselves. We’re there to do a job. Besides, it had been pretty well known at least to a group of us that Morehouse would be doing the talking. And yes, I think there was a feeling among Mario Lemieux and Ron Burkle to find a way to establish some level of accountability without tormenting themselves through a presser. I genuinely don’t know which of the two hates those things more, though I’ll have to guess it’s Burkle since he’s even less visible. As I wrote in my Saturday column, though, I feel both would have done well to do more on this day. PI: When did you know you were invited to a private meeting? Why do you think you were invited? DK: I had an assurance from one of the owners three days beforehand that he’d make himself available to me after any press conference if I had questions. We’d been in regular communication, and I respect that he recognized I have a job to do. And no, I’m not telling which one. PI: Can you explain the rarity of an on the record, no holds barred interview with Lemieux and Burkle? How long did you have to prepare? First off, that’s just not me. I can’t script interviews. I’ve done that a couple times in the past, and they end up horrendous because I didn’t do enough listening and adjusting. For this one, I didn’t have an outline, notes, nothing. The most I’ll ever do is some kind of little four-word, five-word outline. I really was just determined to wing this, let it go wherever it went. Second, there actually wasn’t time to fully prepare because I wasn’t 100 percent certain how the whole thing would go — or who’d be in that room — until, well, really, I was taken in there. PI: Set the scene for us, what was the feeling in the room? Tense? Casual? DK: I’d say Mario set a real casual tone, first off by being really casually dressed (no-lace sneakers!) and then by just kind of lounging back on a couch opposite where I sat. Burkle was to my left, no less casually dressed (he actually joked in comparing their sneakers once we were done), and seemed extremely comfortable, loose and yet authoritative in the right situation, once cutting off when I began to interrupt with a follow-up. I liked that. And I especially liked that it belied whatever reclusive image he might have. The guy’s anything but withdrawn. Overall, though, there’s no tension I could feel for the simple reason that I’ve long experienced a mutual trust with Lemieux, and that was going to override anything in there. When I talk with Lemieux, especially straight pucks, it’s very comfortable. I know he appreciates that I’ve been at this a while and that I can go back to covering him in his playing days (which didn’t always go well for us, by the way). PI: I've always been curious about the relationship between Lemieux and Burkle. Do they convey an air of unity? Do you get a sense that these two guys are on the same page? DK: Well, I suppose it would be fun to say it’s got an element of weirdness to it, but in a good way. On the surface, you’d think they’d be as different as can be, given backgrounds, profession, everything. But they’re amazingly in tune, respectful and sensitive to each other’s comments while at the same time each clearly being his own guy. It’s a wild dynamic, as I remarked to someone shortly coming out of that room. PI: During the interview, David Morehouse spoke up in defense of Lemieux and Burkle; you described the room as becoming "animated" can you elaborate on that? DK: Yeah, I have a feeling that Morehouse thing might have looked worse on the transcript than it was in reality, judging by some readers’ reactions. He had sat silently through most of the meeting, but he seemed to feel compelled to jump in when I raised the possibility that the owners could be leaving their coaches in a lurch. That’s OK. That’s his job, just like I reminded that I have mine. Ultimately, I got answers, which is all that was sought. PI: Do you feel Lemieux and Burkle were frank with you? Are some things already decided or does it all rest with the new GM? DK: The Saturday column kind of tried to poke through that idea that the GM will control everything, because that’s not going to be the case in making the actual hire. They’ll have a vision, a mindset for what they want the Penguins to be, and that’s what I tried to get even before the hire is made. PI: You've known Mario for a long time. How did you gauge his demeanor, his body language? DK: He’d rather have been golfing. PI: So, how does a heavy hockey conversation dissolve into Tennis talk? DK: Dissolve? Bite your tongue! Burkle’s CAA agency represents, among many others, the one, the only Novak Djokovic, world’s greatest tennis player and pretty much King of Serbia if Serbia still had a king. My name kind of set Burkle off on a bit of a tennis excursion, at which point Lemieux and I chimed in with some seriously deep, informed analysis of what’s made Djokovic so talented. There was more. More tennis, I mean. PI: Thanks so much, not only for what you bring to the Pittsburgh sports scene but for your generosity with this blog.